Spring: A time to indulge the urge to purge. Get rid of the old, make room for the new. This year I started with the mudroom closet. It’s the nerve center of our home. Sporting equipment, recyclable grocery bags, overflow food and drink, coolers, shoes. You name it, it’s in there. First I took everything out of the closet. Seeing the contents lying on the floor I realize I’ve upset the organizational universe. What stays? What goes? 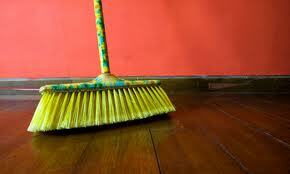 This is my sorting routine. Drag it all out, assess the damage, make a plan and go. An hour later, my mudroom closet has shed the long winter months and is ready for prime time. Next on to the office. Ugh. The problem is (as if there’s just one) the items that are relegated to the office are of varying levels of importance. Tax receipts, articles with dog ears at the corner, random sheets of paper with passwords to on-line stuff, passport renewal forms...and on and on. Theoretically everything needs a second look, just in case. I sort the papers into categories. It’s an interesting exercise to see my life before me, in piles. There is the Household pile: quotes from painters, appliance repairs, paint swatches, car repair receipts, etc. The Creative pile: random ideas strewn on napkins and in notebooks (lots of those) and articles marked with possible points of inspiration. The Volunteer pile: bits of information from various events and committees. Every year I think, “I should save that for the next person.” But then I end up doing the event again, forget that I have the information and re-invent the wheel. But by far the biggest pile is the Kid pile. I consider myself a perpetual purger in this category. It is not uncommon to hear “Why is this in the trash?” as the boys discover their latest spelling endeavor smeared by coffee grinds and cucumber peels. It’s not that I don’t devour every last math moment but there are so many. And the priceless specimens go right to the basement, to the bins labeled John and Will. So where did all this come from? I commence sorting and soon realize this was the wrong category to start with, it is much easier to toss magazine articles and old bills than memories. Which is how, of course, the office ended up this way in the first place. One of the last crinkled up pieces of paper I find is Will’s. He turns 8 this week which doesn’t bode well for me finding this particular specimen. But it was just the Mom moment I was looking for, to commemorate the milestone. Will was less than enthusiastic about preschool. I’d been used to his older brother skipping in to school like he owned the place and so Will’s reluctance caught me off guard. On the very first day I stood in the pick-up line watching his classmates leave with big manilla posters filled with words and cutout people. When Will came out, he was empty-handed. “He decided not to participate in the craft today,” the teacher said. “But he did draw you something.” She handed me a paper. Will stared at me, with a let’s go look. I didn’t look at the drawing until we reached the car. “Well thank you,” I said finally. 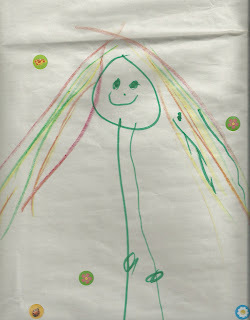 It was a drawing, drawing #1, of me in stick form with long rainbow hair and the words I Love You Mom. And in the middle of my legs (I had no arms) there were two dots. That’s my Will. A profound little man dedicated to facts with a dose of sentimentality mixed in. From that day forward, I received the same drawing: each day, every day at pick-up. The only thing that ever changed was the message. There was something about the regularity of the drawings that left me unable to decide which ones to keep and which ones to recycle. So I kept them all. I suppose back then I thought there would be a day, like this day, when I would weed out, keep a couple and discard the rest. I stare at the drawing, the armless figure with free flowing rainbow hair and a gargantuan smile, my two knees firmly planted in the middle of my long long legs. Spring: A time to keep the old to appreciate the new. At least that’s what I tell myself as I trek downstairs to the basement bins. And carefully place this me with all the other mes, where it belongs. Someday your future daughter-in-law will thank you for saving all these momentos.